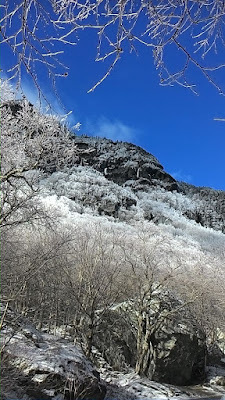 On Wednesday before thanksgiving, 25 November, I was first up in Smugglers Notch. I had a hunch that there would be something or other to climb, so I took the tools for a walk. I am new to the Northeast this season and I don't have a sense of how things form up yet. 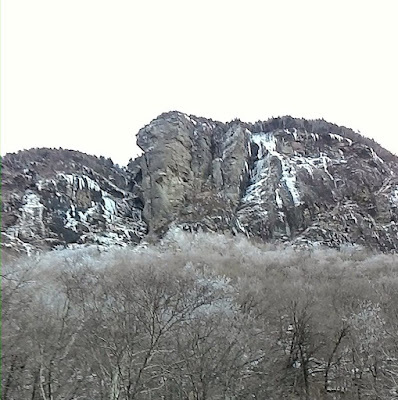 Smugglers Notch is only 45 minutes or so away from from where I'm living in Warren, Vermont. And it isn't such a inconvenience to get over there. On the 25th, the climbs on the right side (coming up from Stowe) were hanging with forming ice, verglassed slabs and wet rock. The upper pitches of the climbs looked like they were coming along nicely. The lower parts where just wet rock or a very thin sheet of ice with water running underneath. The ice on Ragnarock and Elephants Head Gully was coming in but certainly not formed. The west-facing side on the left was much more inviting: shielded from the sun, cold, hoarfrost and a dusting of snow. 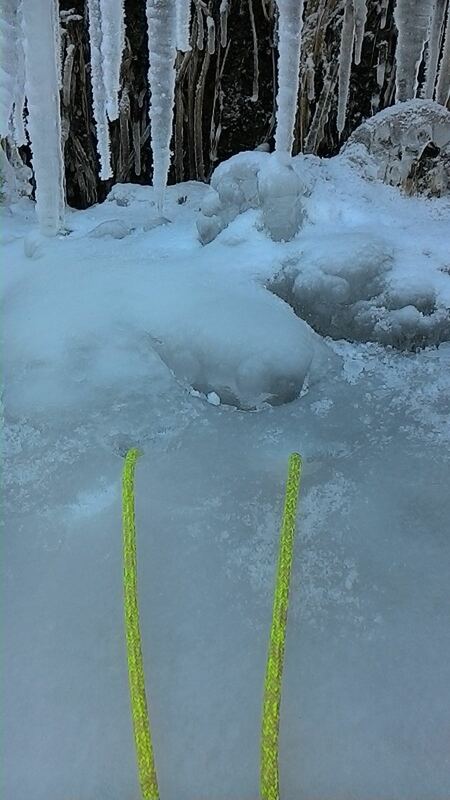 I went up the creek bed to approach the amphitheatre where Blind Fate looked good and a beautiful ice column as part of a line immediately to the left also was promising. I climbed up the final approach gully mixing it up on thin ice and rock until I was under Blind Fate, (III, WI4). I took the Blind Fate option, mostly because I wanted to climb a Bouchard route on two different continents. I moved over the lower angle ramp, trending right. The ice was pretty thin and not always well bonded because of some running water. The upper part was in great shape. Plastic ice, well structured and a joy to climb. I was back up at Smugglers Notch on Monday, 30 November. The warm weather on Thanksgiving Thursday and the following Friday took its toll on the fragile, early season ice. Everything had substantially deteriorated. The Elephants Head Buttress side was stripped of much of the hanging ice and just wet. The climbs in the Blind Fate sector were broken and dangerously unclimbable. All the following photos are from Monday, 30 November. After seeing the effects of the warm weather and changes from Wednesdasy the 25th, I had mentally written-off the thought of finding anything to climb. I walked over the pass with a couple of dog walkers and turned around to head back towards Stowe. As I started descending on the road southwards, I saw the upper ice of a gully tucked-in a cold nook and facing a bit more north / northwest. 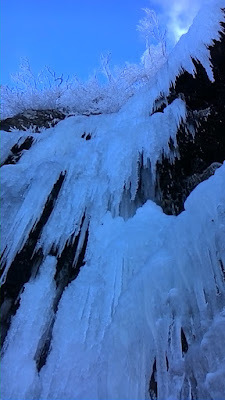 I made my way up a creek bed and into the steep woods towards the promising-looking ice curtain. 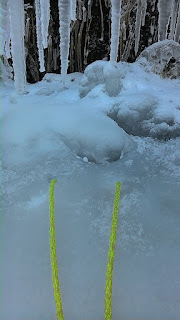 I geared up at the base of an approach gully that was filled with compact ice. 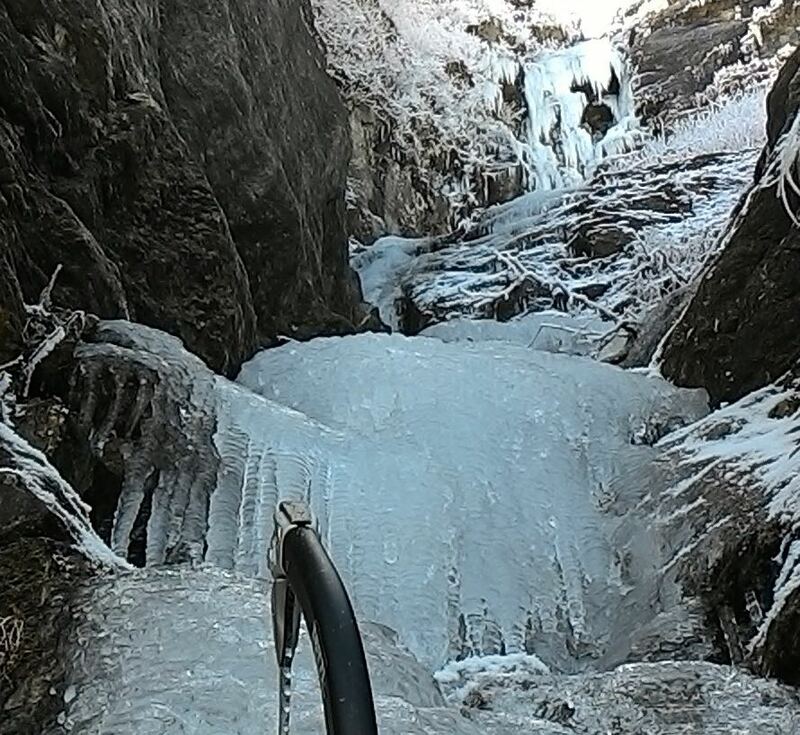 It was about 120 meters of climbing before I got to the upper part of the ice curtain visible from the road. The gully was thin and interspersed with vertical steps of two to four meters with some fun, easy mixed climbing too. I used the ice features to move diagonally right towards a small cave and then up and left in a kind of ice staircase to top out. It was easier than it looked from lower down. The ice was plastic yet well bonded. It was, however dripping / running with melt water over the hanging icicles and forming nice cauliflower blobs. 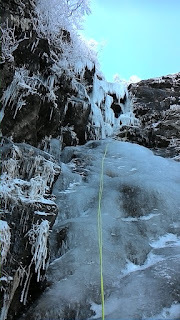 I made five, 30 meter rappels to the base of the ice gully. finding good ice for V-threads was a challenge. I bored four holes for one anchor and equalised them with cord. The rest of the anchors were normal threads, with the last one from a tree. A techical note: I really like my 6mm Rap Line (Mammut, but there are also some from Edelrid). I have used it while soloing in Chamonix last spring and summer. The 60 meter length packs really compactly and is very light. It's pretty unnerving to use it the first time if your not accustomed to such skinny ropes. At only 6mm, I can thread it directly through the V-threads, saving the waste of leaving cord behind when the fall melts out in spring. we met on the Super Bravo chair during a midweek day in Sugarbush's first week open this season. I intro'd myself as a tele skier from mad river glen and the backcountry. We discussed your mountaineering, b/c and ski guiding and coaching in Salzburg and now Sugarbush. I did not get around to visiting your blog until today. Hi There Timo! Thxs for reaching out. Absolutely, lets hook up up for some backcountry stuff. I am leaving tomorrow, 24.12 for the northwest usa and canada to ski & ice climb. I will be back around the 22nd of January. Hopefully we will have some snow in vermont! it's totally depressing now!